This post is sponsored by The Incredible Egg. All opinions expressed are my own. 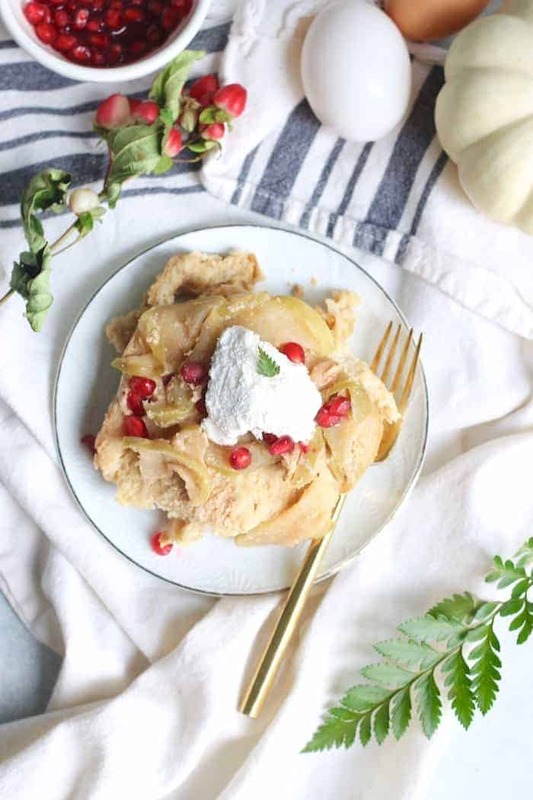 Enjoy this lighter Apple Cinnamon French Toast Casserole for your next holiday brunch. A less rich, dairy-free breakfast bake you can make ahead or bake now! Behold the most yummy and fantabulous breakfast there ever was!! There was a time when pancakes were my life. I couldn’t wait for weekend mornings because they meant one thing and one thing only: glorious pancake stacks. Ok and COFFEE! But ever since I laid mouth on homemade French toast, there was no looking back. 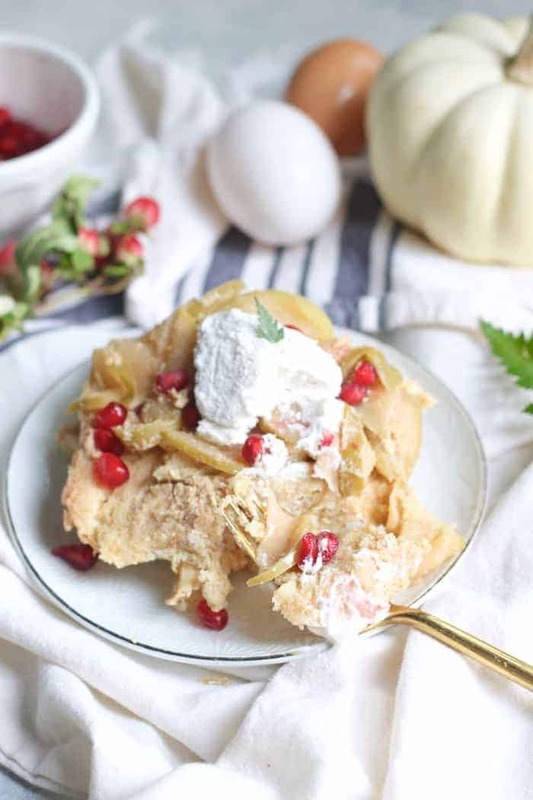 All I want on chilly autumn mornings is the sweet, satisfying egginess that is this Apple Cinnamon French Toast Casserole. So perfect for holiday brunching! The inspiration for this recipe comes from my mumsy. She used to make us challah French toast sprinkled with powdered sugar all the time growing up. I remember waking up to the smell of it! We so looked forward to her French toast, veggie stratas, big bowls of fruit, and broccoli cheese squares. I’m carrying on her legacy today with this lighter Apple Cinnamon French Toast Casserole! Now the first time I made French toast for me and Jeff, I made it with sourdough bread and cooked it on a skillet with apples bubbling in coconut oil, cinnamon, and maple syrup in the other pan. It was FAB. This version bakes up in the oven versus the stove top so you don’t have to cook each piece individually. The coolest part is that, once this baby is done, and after you let it rest (very important, don’t skip! ), you flip it upside down onto a platter and all the wonderful gooey apples are on top! How magical does that sound? It’s perfect for a crowd and I assure you, it will impress. French toast means French bread. Right? Well, I’m not exactly sure. But I do know that you’ll want a yummy bread for this, and the crusty loaf of French bread at the store was calling my name. Kind of like not cooking with wine you wouldn’t drink, don’t make French toast with bread you wouldn’t eat. Sourdough, French, brioche, challah, ciabatta, YES! All contenders for incredible French toast. The dry crunchy one at the back of your freezer? No thank you. Choose a bread that’s drier so it can soak up all that yummy batter in each and every hole. No fresh bread here! Buy a loaf on Thursday and let it sit on the counter till the weekend for perfect French toast. 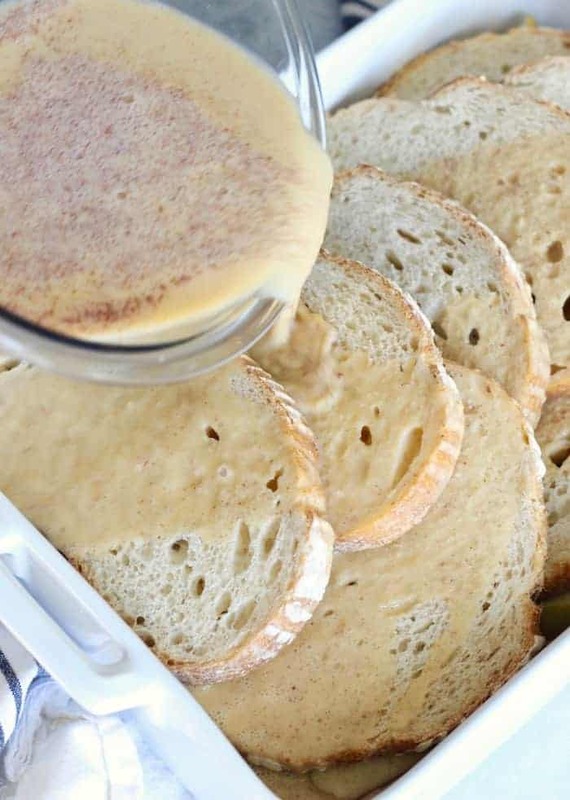 To make this recipe gluten-free, simply use your favorite gluten-free bread. 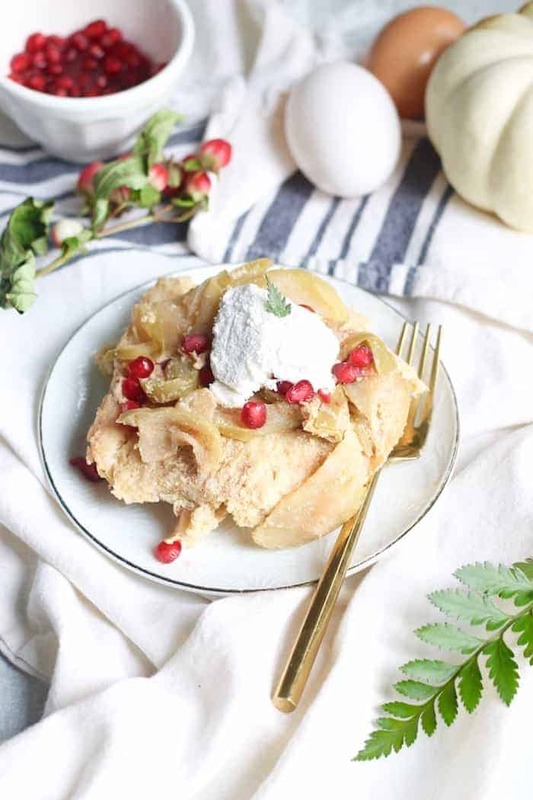 This Apple Cinnamon French Toast Casserole is a bit more nutritious than typical French toast recipes as it’s made with almond milk and pure maple syrup (a much smaller amount than similar recipes), as opposed to refined sweeteners and cream. The key to the flavor in this French toast casserole? Clearly the cooked apples but also, the almond extract! It adds irresistible yumminess. Be sure to get a high-quality pure almond extract that’s not artificial. You should see “bitter almond oil” on the ingredient list. Another key flavor and texture component? Incredible eggs, of course! With 6 grams of quality protein and nine essential amino acids in one large egg, we’ve got an affordable nutrition powerhouse on our hands. Did you know eggs are one of the only natural sources of vitamin D? They’re also one of the richest food sources of choline, an important nutrient for optimal brain functioning. And don’t toss the yolk! That’s not only where the concentrated choline, B12, and selenium are, but also where you’ll find 40% of the protein. Head to the Incredible Egg’s site for more information and recipe inspiration! And guess what? You can recreate this recipe for a chance to win an awesome holiday giveaway prize including Le Crueset bakeware! Post your recipe recreation on Instagram with the hashtag #IncredibleHolidayBaking to enter to win! To view full contest rules, please click here. Now you can bake this healthier french toast casserole right away or you can let it sit overnight and bake in the morning—whatever is easier! This recipe would be so amazing to wake up to on Christmas morning. With the holiday season upon us, I’m SO happy to give you the gift of a simple, satisfying brunch recipe that you can cozy up to with the ones you love most. Let’s celebrate! 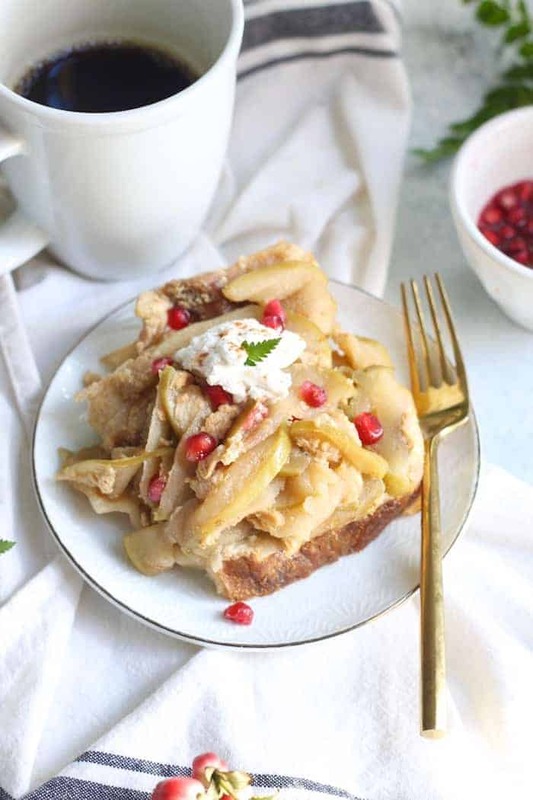 Enjoy this lighter Apple Cinnamon French Toast Casserole for your next holiday brunch. A less rich, dairy-free breakfast bake you can make ahead or bake now! Preheat oven to 375 degrees Fahrenheit. Spray a large baking dish (I used 11x17in) with cooking spray. Melt coconut oil, 4 tbsp maple syrup, and 1 tsp cinnamon in large skillet over medium low heat. Once hot, add apples and stir to combine. Reduce heat to a simmer and cook, covered, for 10 minutes. Pour apple mixture into baking dish. In a medium bowl, whisk eggs until foamy. Add almond milk, remaining 2 tbsp maple syrup, vanilla and almond extract, and remaining 1 tsp cinnamon. Whisk until smooth. Dip each slice of bread in the mixture and then place bread slices in two rows on top of apples, overlapping the slices. You can break some pieces to help it fit. 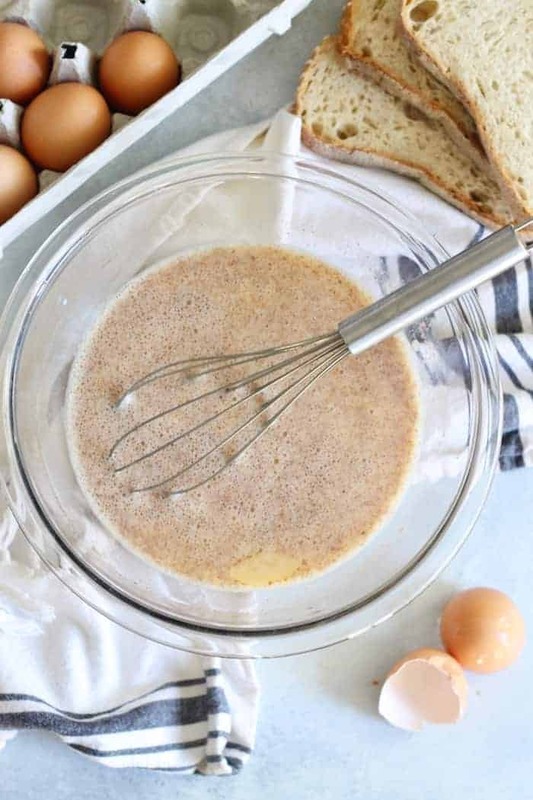 Pour remaining egg mixture on top and use your fingers to push bread down so it absorbs the mixture. Bake for 35 minutes. Alternatively, you can cover casserole with plastic wrap, refrigerate overnight, and bake in the morning (let it sit out at room temp while you preheat oven). Allow casserole to sit for 10 minutes before serving. After casserole has rested, place serving platter on top of casserole and carefully flip over so apples are on top. Sprinkle with pomegranate arils for a pop of color. To serve individually, use a spatula to remove portion and flip onto plate. Serve with whipped cream! So cozy! This is so good with a big ole cup of coffee! We made this for breakfast today and it was delicious!!! We had to ad two more pieces of bread to make it work. We also dipped each slice in the mixture before playing it in the pan. It was nice to have French Toast without being bathed in syrup. My teens (15+13) enjoyed this and even ate the pomegranate too!